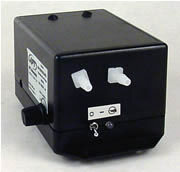 The PM60 series of diaphragm pumps are self-priming, can pump air, gases, and liquids and simultaneously create a vacuum. 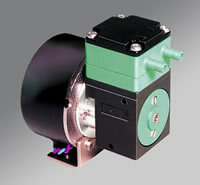 These pumps feature a one-piece molded PTFE diaphragm, eliminating metal wetted-parts. They are ideal for use in portable, battery-operated equipment where high performance, low power consumption, and minimal weight and size are desired. Flow rate up to 600 mL/min (700 mL/min air). Pressure up to 33ft, suction up to 16ft. Download PM60VO Product Sheet (.pdf, 33.1KB). Download PM60VC Product Sheet (.pdf, 36.8KB).